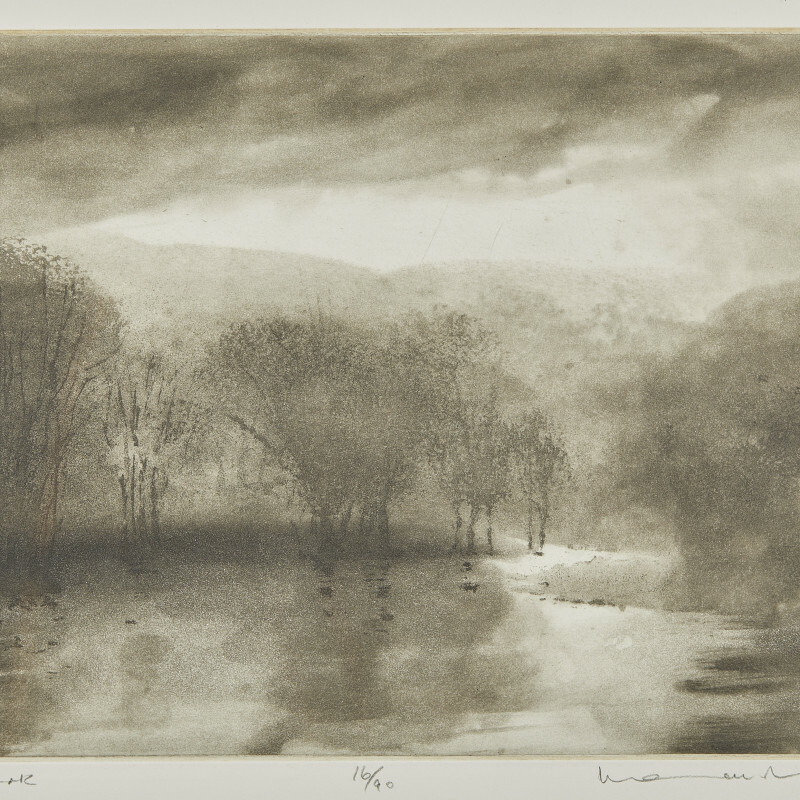 Norman Ackroyd was educated at the Leeds College of Art from 1956-1961 and then went on to study further at the Royal College of Art, London from 1961-1964 where he studied under Julian Trevelyan. In the 1980s Ackroyd emerged as a landscape artist, his prints range from tiny etchings, intended to be bound into books, to huge scale works. His preferred medium for working directly on to paper is watercolour, including in a project published under the title Moored Man in 2006, in which his watercolours were paired with poems by Kevin Crossley-Holland. Other publications include a limited edition of 295 books called Arlott and Ackroyd, published by Christopher Saunders in 2002. This book wasa celebration of Cricket, Wine, Poetry and Place with commentary by David Rayvern Allen. In 2003 Ackroyd completed 20 external mural images at Lazard, Stratton Street, London and the book, The Stratton Street Series, depicting the images was published. Most recently, published in 2009, A Line in the Water, designed by Isambard Thomas. This second collaboration combined Ackroyd’s works with poems by the award-winning Douglas Dunn and took the reader around the British coast through word and image. Some 80 prints are featured in this book, interleaved with 15 new poems by Dunn, including Working with Norman, based on their visit to the most northerly point of the British Isles. Ackroyd designed a number of large scale, etched reliefs in steel or bronze, commissioned for architectural projects in London, Moscow, Birmingham and Glasgow. In 2013 he was featured in the BBC documentary What Do Artists Do All Day?. Since 1986 Ackroyd has completed a number of internal and external mural commissions along with The Stratton Street Series. Other examples also include at The West Indian Cultural Centre, Haringay, London in 1986; Lloyds Bank Technology Centre, Park Street, London in 1990; Tetrapak, Heathrow in 1991; Freshfields, Fleet Street, London in 1992; British Airways, Birmingham International Airport – Eurohub in 1993; The Great Hall, British Embassy, Moscow in 2000; Great Portland Estates, Wells / Mortimer Street, London in 2008; and Galapagos, for the Sainsbury Laboratory, University of Cambridge, London in 2010. He was elected Royal Academician in 1988 and later appointed Professor of Etching, University of Arts. In 2000 he was elected Senior Fellow, Royal College of art and went on to be awarded a CBE for services to engraving and printing in 2007.